Mrs Helicopter Writes: Happy Post!!!! This will be a HAPPY post...so firstly, the itching hasn’t so far been too bad. Despite amazingly lush hot weather which could potential make it worse, it hasn’t yet. And that’s the next thing….we’re having a suuuuuuuummmmer! Amazeballs! I am *SO* happy about this weather. Even tho it’s causing some sleepless nights (which I am used to) for me but also for a little over heated hot boy. He keeps coming home from nursery covered in sweat & dirt from playing out all day. Then falling asleep before bedtime only to wake up in the middle of the night overheated and overwrought, bless him. But we spent all weekend in the paddling pool and intend to do the same this weekend. Hooray! I LOVE the paddling pool! I still remember the excitement I would have as kid when it came out. I may not be QUITE as excited as that but put it this way….I spent longer in it than my son this weekend. We thought about going to the beach or going for a day out on the weekend but actually our house is at its best in the sun. Our garden is definitely its best feature. I do moan about my house quite a lot so it’s nice to be able to boast about it once in a while. Another thing I am really noticing in this pregnancy is that I am so much more active. It sounds stupid and probably pathetic but the constant sickness last time meant I didn’t want to do a thing, or go anywhere. I pretty much spent the whole time slumped on the sofa feeling sorry for myself and trying to avoid gross smells. Aka everything. I probably really unfit still and I am walking slower than a sloth, which is annoying. I’m used to walking quite fast (mainly cos I find walking boring and I just want to GET THERE! Impatient, moi?!). And I am puffed even walking up the stairs. But I am doing things all the time. I keep thinking of things to do around the house so that they’re “done” in time for the baby….which makes no sense really. My baby isn’t gonna care what colour my front door is! Btw is it too early to be nesting? I think I naturally nest tho so maybe I’ve gone into uber nest mode?! Don’t tell me why I even remember that film from when I was a kid. In fact I don’t really remember the film, I just remember the stupid game! And Hayley Mills. And her voice. Don’t get me started. Look at this bad boy! Phwoar! The next thing I am GLAD / ecstatic about is the return of a) a mini ability to handle garlic, meaning my food restrictions have been lifted and I am able to eat stuff that isn’t completely bland….hoorah! I’ve even managed some Thai Food! Altho I kept breathing on myself afterwards trying to gross myself out with the smell of garlic…. And b) COFFEEEEEEEEEE!!!! I can have / ENJOY coffee again! OH god I missed you old friend! 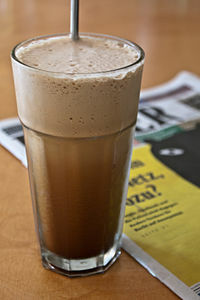 I celebrated this revelation with a double espresso (I STILL call it "eXpresso"…idiot) frappé from Coffee#1 this avo. LUSH STATIONS!!!! Then I got the mega paras (i.e. paranoid) that I had gone over the recommended daily caffeine amount for preggo’s. I hadn’t….phew! You’re allowed 200mg a day or preferably less and a shot is approx. 65mg. YES. I can stop fearing the onslaught of diabetes from my pop ingestion and go back to good old fashioned coffee. Right I think that’s enough positivity for one day. Me and my espresso addled mind are now to going to attempt to get some sleep (I hear Mr Insomnia laughing his ugly head off! )….Ciao for now bloggites! I always say eXpresso too so you must have learned it from me! !